Loaded with beans, sweet corn, and tons of veggies, this Mexican-inspired soup will fill you right up. Get the recipe. How could something vegan taste so creamy, you might ask? The secret lies in a combination of curry paste, vegetable broth, and peanut butter. Get the recipe. 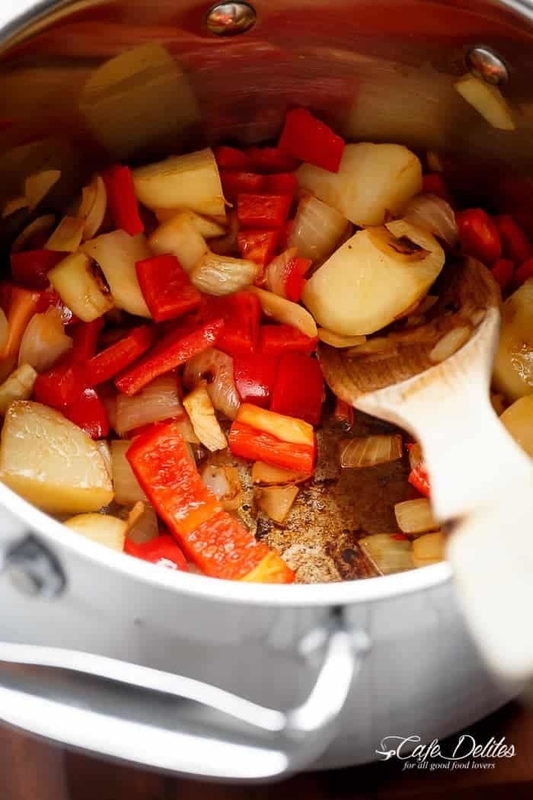 Roasted tomato, potatoes, and peppers sautéed in garlic and olive oil give this soup a super rich texture without any milk or cream. Get the recipe. 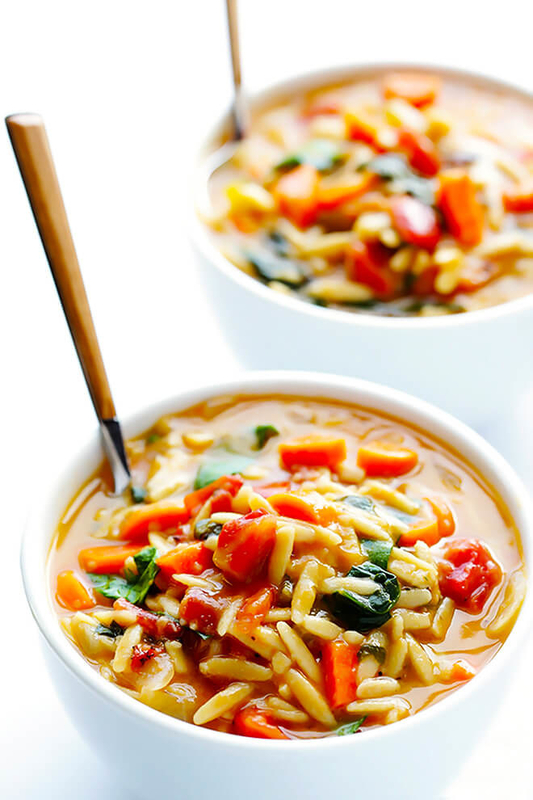 Use water instead of chicken broth to make this fragrant soup. It has plenty of flavor already from shallots, onion, ginger, garlic, and soy sauce. Get the recipe. 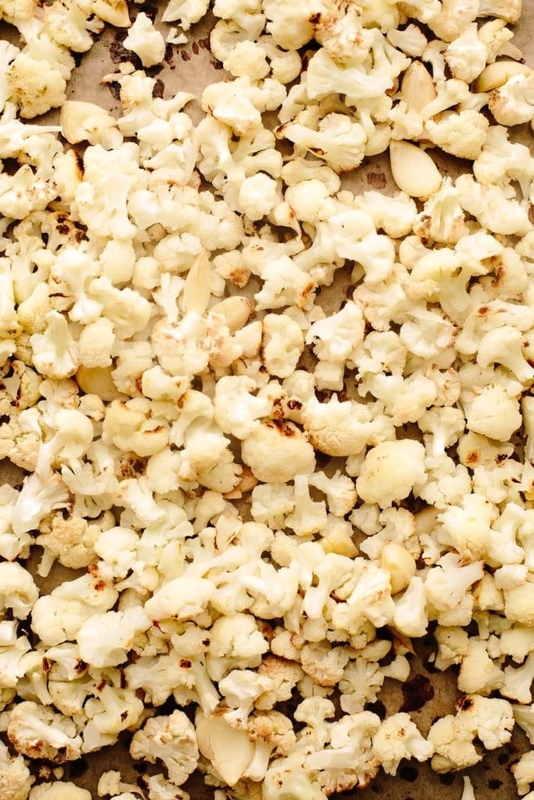 Cauliflower is truly a miracle vegetable. Don't believe it? 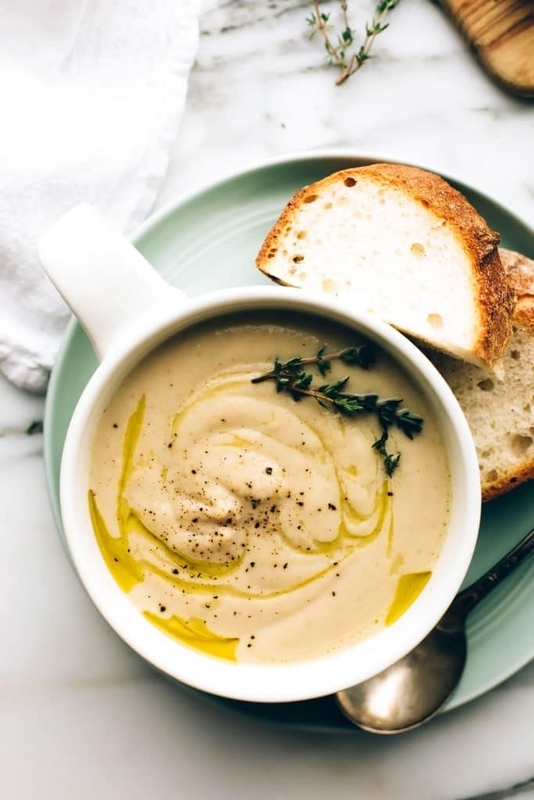 Wait until you try a bowl of this decadent soup made with little more than veggies, vegetable broth, almond milk, and spices. Get the recipe. Looking for a 30-minute dinner? Opt for this vegan recipe made with tender veggies, white beans, and noodles all simmering in a tomato-based broth. Get the recipe. This Mexican take on tomato soup is full of protein, thanks to black beans and quinoa. It also gets quite the kick thanks to jalapeño peppers, cayenne and cumin. Get the recipe. Tender chickpeas take the place of chicken in this ultimate comfort food. Make a big batch and save some in the freezer for later. Get the recipe. Baby bella mushrooms and ramen noodles get simmered in a savory miso broth. Get creative with this base recipe and add anything from scallions and red pepper flakes to nori and crispy tofu. Get the recipe. If you thought pesto is meant just for pasta, think again. This vegetable soup gets a serious upgrade thanks to a simple, vegan homemade pesto. Get the recipe. 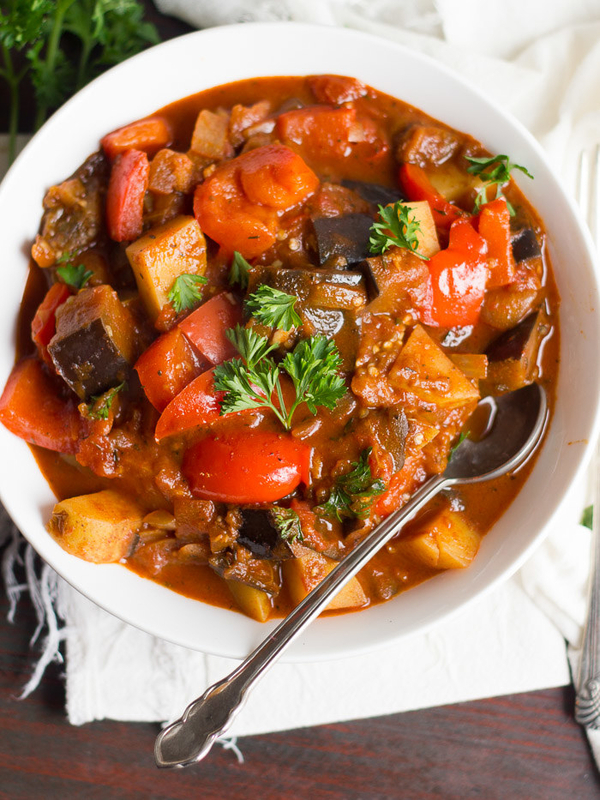 This vegan take on the eastern European classic stew will warm you up and fill you up at the same time. 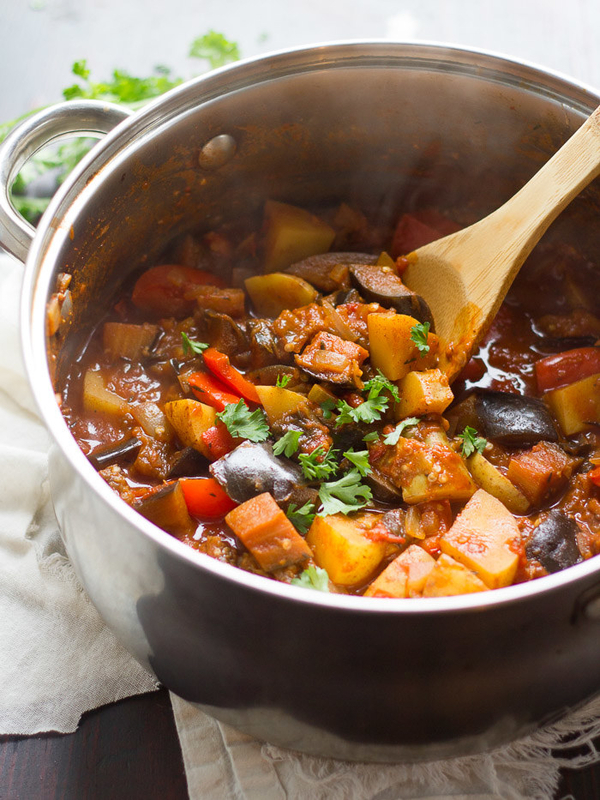 Sautéed eggplant, onion, and bell pepper get a flavor kick from thyme, bay leaf, soy sauce, and a mixture of smoked and sweet paprika. Get the recipe. The key to this dairy-free but totally creamy recipe: Cashew milk. It gets combined with vegetable broth, white beans, veggies, and a hefty portion of roasted garlic. Get the recipe. You can officially cross wonton soup off your takeout order for life. This delicious Asian-inspired soup tastes even better when its homemade. Get the recipe. Laksa is a classic comfort food from many Asian countries like Malaysia and Singapore. This version is made with coconut milk and a homemade laksa paste made from red chili, garlic, ginger, cashew nuts, and lime. Get the recipe. 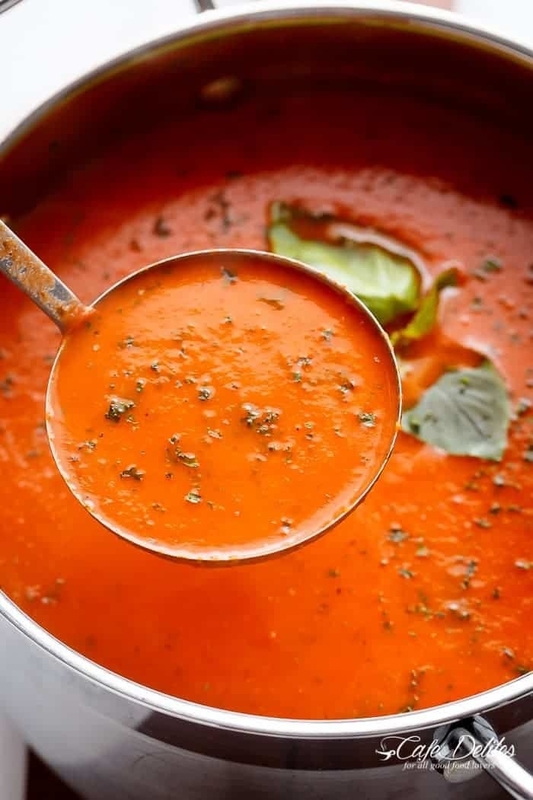 This recipe could not be easier: All you need are a few simple ingredients and it's ready in 25 minutes flat.Get the recipe. You're going to want to become very familiar with this recipe for five-ingredient vegan pesto ricotta, because you'll want to put it on just about everything. Get the recipe. 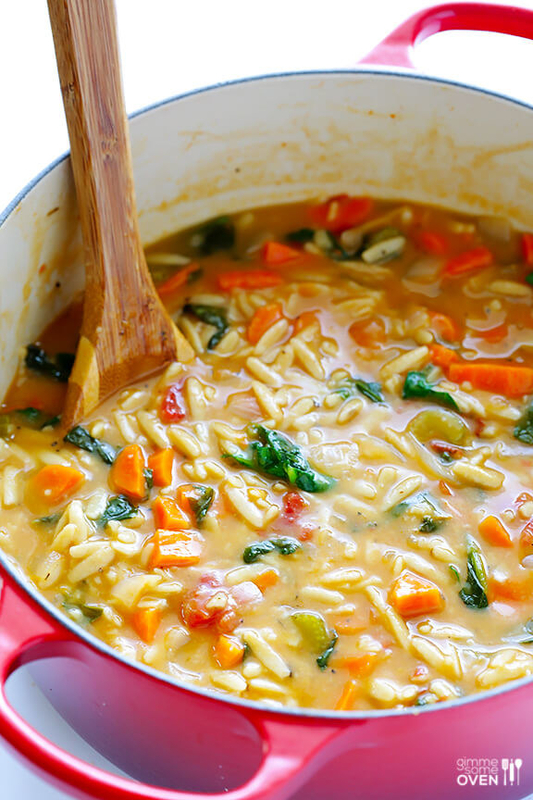 One pot and thirty minutes is all you need to make this decadent recipe. Need I say more? Get the recipe. The shopping list for this vegan chili may look intimidating, but the majority of ingredients you need to make it are spices and condiments that are already sitting in your kitchen. Get the recipe. The beauty of this recipe is you can dress it up or down using your go-to ingredients or what you have in your pantry like noodles, tofu, or any of your favorite veggies. Get the recipe.